The Fourpenny workshops latest restoration complete and ready for sale! This rare and genuine antique Shepherd's Hut was produced by Tasker & Co at Waterloo Ironworks, Nr Andover, Hampshire. We purchased it from an estate on the Wiltshire, Dorset border. At almost 170 years old it is the oldest hut that has been through our workshop to date. Tasker was once Hampshire's most prolific hut makers, also producing steam engines and rollers. The fact that the tally on this hut says Tasker & Co indicates that it was built before the name change to Tasker & Sons in 1850. The intricate style of the front axil shows that the hut was once horse-drawn, now found with a draw bar fitted. Other original features include the wood burning stove and drag shoe. (This really is as close to Thomas Hardys "far from the madding Crowd" as one could get! We have done much to preserve these original features, at the same time doing just enough work to give this beautiful lady a new lease of life. All the wheels, metalwork and even the tin was removed and put back causing as little disruption to the original rivets and bolts as possible. The original rotten and tired chassis and axils were copied in detail and reproduced in Douglas Fir and Oak in our workshop. A new door and access steps were also crafted from reclaimed timber. We managed to save most of the internal timber apart from the ceiling where we have used reclaimed c1900 timbers as replacement. A genuine antique and rare example of a locally made Shepherds Hut . We're just packing up ready to head to the 2017 Garden Show at Stansted Park. It's this weekend - starting on Friday 9th June until Sunday 11th June and it's fair to say that we're rather looking forward to it. The venue is Stansted House near Emsworth, set in 1750 acres of fabulous gardens and woodland. As well as an amazing collection of paintings and treasures in the house itself, the venue also boasts a stunning arboretum and a beautiful little chapel. There is of course a brilliant cafe, and the Stansted Park Farmshop too - and there’s a wonderful maze with a kilometre of hedge to get lost in - so it’s a great place to visit even when the Garden Show isn’t in full swing. A visit to the Stansted Garden Show is a fantastic way to get some inspiration for your garden. With a huge collection of stands from artisan designers and makers, specialist plant nurseries, garden architects and craftspeople - there’ll be plenty of ideas for planting, garden buildings, water features and for unique additions to your outside space. There will also be plenty of horticultural experts milling around and offering advice plus lots of crafts and projects you can try with kids - not to mention tons of foodie stalls with delicious treats to try and buy. You can find out more at www.thegardenshowonline.com. We’re going to be showcasing one of our favourite recent Shepherd’s Hut restoration projects at the Garden Show. It’s the oldest hut we’ve ever worked on and it dates back to 1850. Originally built by Andover Shepherd’s Hut makers Taskers and Co, The Garden Show is its official unveiling and we’re hoping that it will catch someone’s eye as it’s now for sale. We’ve restored this wonderful Shepherd’s Hut and given it a new lease of life so we’re looking forward to seeing it sitting in the glorious grounds of Stansted House - and we’re hoping to showing plenty of people round it. As well as our Shepherd’s Hut, we’ll be talking about all of our other projects - building outhouses, creating workspaces and constructing furniture and details for a myriad of purposes. We’re looking forward to a good chat with other like-minded stallholders too. A Fourpenny Workshop exhibit wouldn’t be complete without a selection of our characterful Mini Shepherd’s Huts. We’ll have plenty of different styles to choose from and we’ll be selling them at Stansted Garden Fair at a very special exclusive show price of just £100! So not only can you have a lovely day wandering around the gardens, you can pick up gardening tips, get garden inspiration, see our oldest ever Shepherd’s Hut and bag yourself a mini piece of original Fourpenny art. We think that gives you plenty of great reasons to come along to the Garden Show at Stansted this weekend. Hopefully we’ll see you there - we’ll be the ones with the Shepherd’s Hut so make sure you pop over for a chat. At the Fourpenny Workshop, there's nothing we like more than rescuing an abandoned, neglected or dilapidated Shepherd's Hut. It's hugely rewarding to transform a redundant hut back into into a Shepherd's Hut with a purpose. 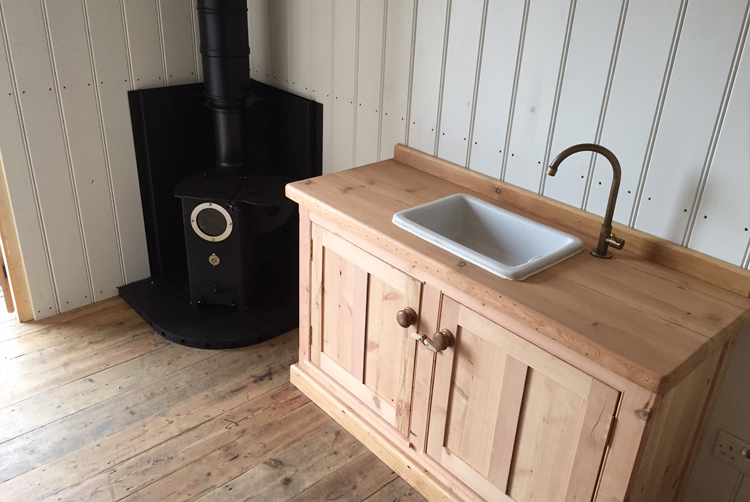 One of our most recent Shepherd's Hut restoration projects has been a fairly straightforward, but thoroughly rewarding process. The Shepherd's Hut in question was a Lott & Walne Shepherd's Hut from the early 1900s, which would have originally been made in the agricultural engineer's Dorchester iron foundry. It had since found a home on an Isle of Wight Farm but had fallen into disrepair and been patched up with modern wheels, not in keeping with the original classic hut design. The owners wanted to see their characterful Shepherd's Hut restored back to it's former functional glory, whilst maintaining its wonderful distressed finish and aged style, so that's what we promised. The restoration brief also included building a new bunk for the interior so the Shepherd's Hut could be used as a garden guest room for friends and the owners daughter to camp out in. We headed across to the Island in the Spring sunshine and loaded the dilapidated hut onto the trailer, all ready for its revamp back at the Fourpenny Workshop. The first task was to give the Shepherd's Hut a brand new pair of wheels and a sturdy new axel, which is something we're pretty well versed in. We design the wheels ourselves and they and the axel pins are made in the classic way by a south coast foundry. We always incorporate the original axel style too, complete with the all-important ability to rotate, so manoeuvrability is never a problem for Fourpenny Shepherd's Huts. The leaky old Shepherd's Hut needed a brand new roof and a replacement side panel to make it weatherproof, so that's what we gave it next. As the owners were keen to keep its classic rustic charm, we left the side panel unpainted to weather and tarnish naturally and blend in with the rest of its funky vintage paint job. Many of the original features and details of the Shepherd's Hut were still visible and functional, like the lovely door hinges and the makers plaque. We left these just as they were (bar a quick dust off). Inside, the original wooden panel work was as lovely as ever and the original wooden benches were a carpenter's dream, All we really needed to do was build a bespoke wooden bunk bed to sit under the window and make a handy stepladder for easy access. We used our expertise in Shepherd's Hut design history to make sure our new additions were right at home in this beautiful vintage Shepherd's Hut. 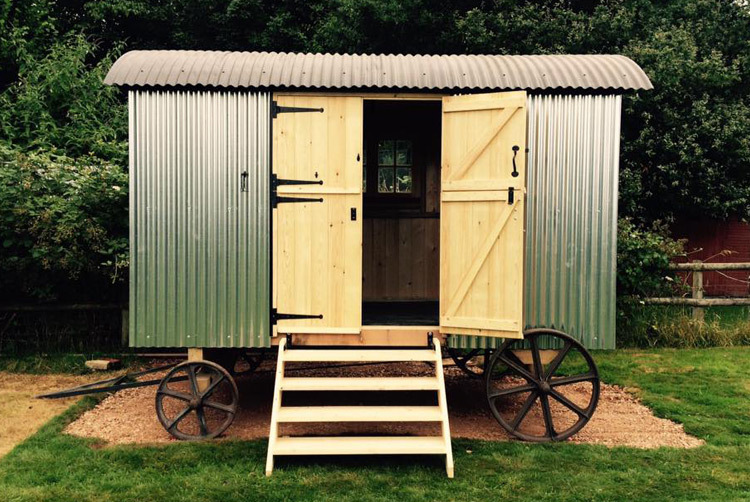 The finished, revamped Shepherd's Hut with its authentic wheels, new roof, new side panel and improved interior space was then ready for delivery via trailer, to its new home in a Hampshire country garden. We were even able to trail it around the Fourpenny Workshop on the back of our Land Rover, because of its sturdy new axel. The restored Shepherd's Hut will now make a brilliant playhouse, garden room, guest room and campsite for the owners and their family. It suits the garden space perfectly and it's fair to say that everyone's very pleased with the result, especially the Fourpenny Workshop team. This restoration project has been the perfect opportunity to make the most of the existing quirky charm and character of one of our favourite kinds of Shepherd's Hut and re-instate it as a fabulous family heirloom. If you have an ancient Shepherd's Hut that's in need of some TLC or know about a hut which could benefit from a little bit of the Fourpenny Workshop treatment, why not get in touch? However dilapidated it is, we can restore it back to something splendid - and we love a challenge. Alternatively, if you like the idea of having your own newly fashioned Shepherd's Hut - just give us a call to discuss. When The Fourpenny Workshop was called on to create a brand new office space that would make the most of the corner of a garden with a lovely view, we jumped at the chance. Our customer was after a bespoke building, specially designed to suit a fairly small, redundant space and it had to work with the modern style of their home and the sloping nature of their garden. Although we’re well known for our Shepherd’s Huts, restoration projects and knowledge of historical buildings, at the Fourpenny Workshop we can turn our hands to more contemporary projects too - in fact, we've used some fairly high-tech, innovative materials and techniques for this Chalet building project. We visited the site to take measurements and discuss the project requirements (as well to consider the direction of the sun to ensure our new outbuilding would be light and bright throughout the day and evening) and we then fed all these elements into our design process. 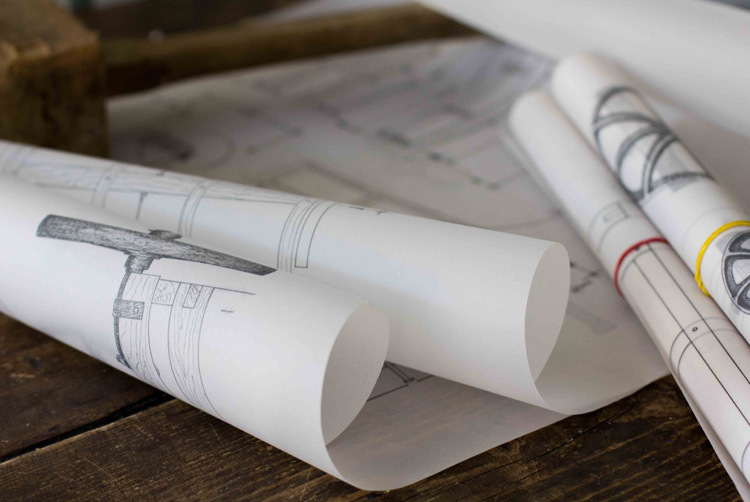 As with all of our bespoke building projects, we drew up a set of detailed plans so our customer could see exactly what we were going to create and could give his seal of approval before we actually began the build process. 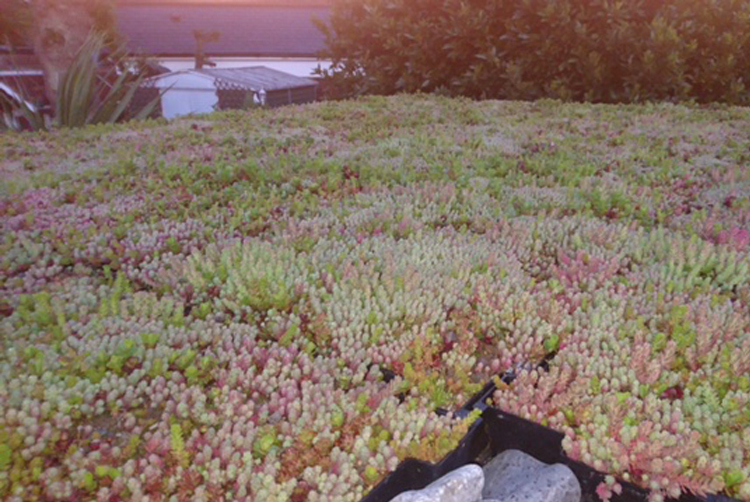 Although the slope of the site was a bit of a challenge, we used it as inspiration for our design and incorporated an accentuated roof pitch. 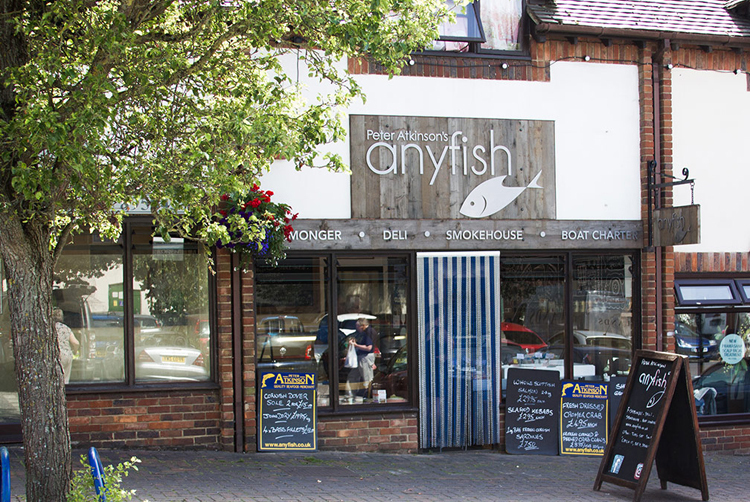 We wanted the building to be full of light and to bring the outside in, so we maximised the windows (aiming to keep them contemporary in style and clutter free) and we opted for extra tall aluminium doors too - simple, modern and practical. There was quite a bit of initial groundwork at the site (exacerbated by the slope) but once we’d set the foundations, we created a base line of Staffordshire blue bricks which was smart, sturdy and contemporary. The perfect partner to the rest of the materials we had in mind. A concrete floor finished off the first stage. The main structure was built using a SIPs system (Structured, Insulated, Panels). These consist of two sheets of high performance sterling board, sandwiching a thick layer of eco therm insulation between them. These panels can be easily fabricated and prepped (back at the Fourpenny Workshop) and then simply erected on site, creating a strong, well insulated framework for construction projects. We chose a rubber roof system for this outside workroom project - durable throughout wild weather and hot sunshine and also good at sealing noise in (or out). Perfect for outbuildings intended to house a good music system, or a cinema screen - or for builds in noisy neighbourhoods. We incorporated a substantial overhang at the front of the building, creating a verandah area to blend the interior space with the garden and make a lovely spot for a drink in the sunshine. The garden Chalet was already starting to take shape, but the addition of the beautiful red cedar panelling (one of our favourite wood types) really added the wow factor. The cedar was finished by machine for a clean, modern look (rather than with our usual, classic Fourpenny feather or waney edge) and we fixed the cedar vertically. The windows and doors are black aluminium - strongly contrasting with the red cedar but not detracting from it and they allow for a siteline all the way through the building to the garden beyond. We completed the project with interior plasterboard and a plaster skim throughout the room - all ready for a nice fresh coat of paint. To make this gorgeous Garden Chalet thoroughly useable we’re also going to be laying a reclaimed wood floor and installing a stylish and functional wood burning stove. This lovely simple build will become a garden office, relaxation room and bolthole for the family and the wood will weather beautifully. If you’d like your own bespoke garden Chalet, an outside office space or a garden guest room, why not get in touch? Whether your style is cool and contemporary or a little more rustic, The Fourpenny Workshop could be exactly what you’re looking for. At the Fourpenny Workshop, we like to think we know our stuff when it comes to the humble Shepherd's Hut. With Chris's expert knowledge of historical buildings and carpentry, Matt's encyclopaedic knowledge of Shepherd's Hut design history and our combined experience in the workshop - we can create a new Fourpenny Shepherd's Hut from scratch that will suit you down to the ground. We'll develop a design to suit, build the axel and produce the metalwork, we'll build the walls, add finishing details and even paint it your favourite colour. Shepherd's Huts designed, developed and delivered to you, just as you'd like it. But if you fancy a more 'hands on' experience, we can help you out with that too. Constructing your own Shepherd's Hut can be a thoroughly rewarding experience (and we'd actively encourage it) but there are a few potential pitfalls along the way which could halt proceedings or flatten enthusiasm. For this reason we offer our 'Shepherd's Hut Plans & Parts' service. At one end of the scale, if you fancy one of our popular, newly built Fourpenny Shepherd's Huts but you'd like all the bits delivered flatpack style so you can have the glory of putting it together - we can create a kit for you. If you'd like to use your own reclaimed wood but you'd like us to provide metalwork, we can cast wheels and shape a roof to fit your spec. At the other end of the scale, perhaps you just need a good set of reliable plans to work from? We can provide tried and tested Fourpenny Plans for a new self build Shepherd's Hut that will ensure you're heading in the right direction throughout. Our plans have all been inspired by traditional Shepherd's Huts, carefully developed and hand drawn to scale so they're easy to interpret. We're always on hand for a bit of advice too. Give us a call or drop us a line to find out more about our Shepherd's Hut Plans and Parts, to order some particular items, or to buy a Fourpenny Shepherd's Hut for your garden. The Fourpenny Workshop website has had a bit of a facelift. 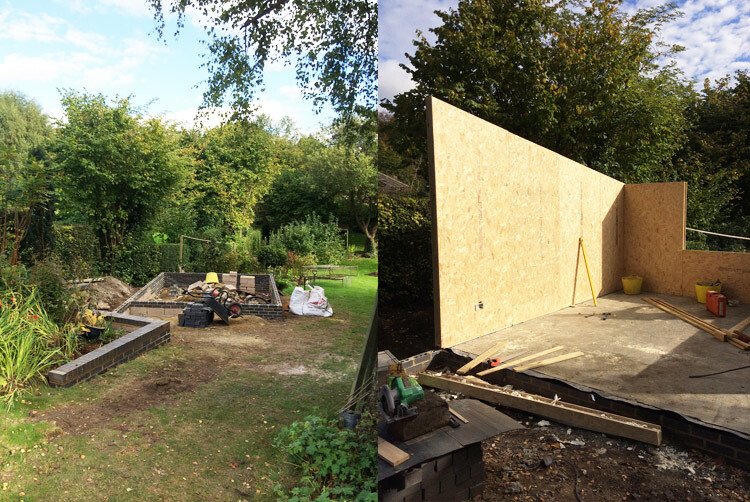 A bit of a tidy-up and a modest extension has been carried out, so now there's plenty of room to show off some fabulous photographs of our Shepherd's Huts and Summer Houses and to keep track of the interesting building projects we've been working on. As well as plenty of lovely pictures and a little bit about what makes The Fourpenny Workshop tick - the part of our new website that we're seriously excited about is our very own Fourpenny Shop. The Fourpenny Shop means we can now sell our unique, handcrafted mini Shepherd's Huts (made from reclaimed, upcycled and rescued full-size Shepherd's Huts) direct via the power of the wondrous world wide web. We've had them specially photographed to show off their individual details and characteristics and it's an easily clickable process to become the proud owner of one (or other) of them. There's just a small selection of mini Shepherd's Huts to choose from for now, but they're all perfectly formed little pieces of art. In fact, seeing as Christmas is just round the corner, we'd say they're well worth considering as special gifts (particularly if you can't fit a full sized one in your garden). The Rotating Summerhouse was a concept popularised during the first half of the 20th Century when renowned Norwich based firm ‘Boulton & Paul’ produced a range of revolving wood framed shelters. Favoured by the eccentric, the well heeled and the artistic, they provided escape from distraction, fresh air and sunlight, but could be positioned away from driving rain or blustery winds. Famously, George Bernard Shaw had a revolving summerhouse and in it he penned some of his best known plays so they are obviously inspirational spaces! This Rotating Summerhouse was a restoration project so we made sure we retained all the original features and details of this fabulous little space. If you fancy one of these Rotating summerhouses for your garden, why not give us a call? This quirky Fourpenny Workshop commission was hatched last summer, after Chris created an ingenious drawing which captured our client's imagination and promised to impress their feathered friends (who were in need of a little egg-laying encouragement). The design is one which makes us smile (which is always a good start) and it certainly fulfils all the exacting requirements of a modern chicken-about-town, including a penthouse suite (plenty of roosting and nest box space), inbuilt air-conditioning (by way of a simple through-ventilation system) and a state-of-the-art security system (pull handle and shutter door). Our specially designed, Chicken Coop was built from cedar wood, cut and supplied by our good friend Eddie at the Sustainable Saw Co. Cedar is one of our favourites because as well as smelling good, it's very durable and has naturally occurring properties which help to protect it from insect attack and rot. We made the Chicken Coop as manoeuvrable as possible too by incorporating a set of reclaimed cast iron wheels. This means it can easily be moved to greener pastures as and when required. If your chickens could do with something similarly spacious and stylish to live in, why not drop us a line?